must-have artist amongst serious art collectors. He’s written two books, has shown in Saatchi Gallery, and has worked with legendary British fashion designer, Paul Smith. 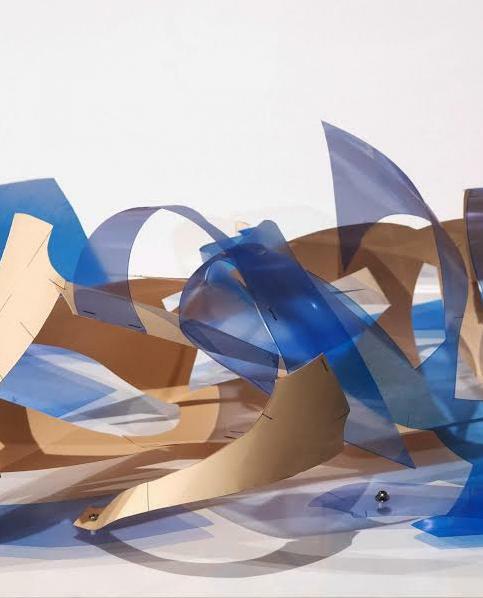 His practice revolves around collage, and the use of discarded tailoring patterns; blending art, fashion, and sculpture seamlessly to create unique works of art. My practice began in the workrooms of eminent Savile Row tailoring house Dege & Skinner, where I learnt from Managing Director – William Skinner; that they would discard bespoke patterns of customers who, are now, sadly, deceased. The patterns have no value to the firm without the physical body present. I wanted to rescue the patterns and create objects and pictures out of them. …explains the sharply-dressed artist of his exciting collage works, with the faded tailor marks peeping from behind bold cuts of colour. I was quite interested in the curatorial output of the show that explores mark making. In my practice process is key to the realisation of the work. I begin with a material that already exists – tailoring patterns. They are either hand drawn by Savile Row cutters from Dege & Skinner or I use antique French domestic patterns, which are printed on fragile paper. I was selected by the Crafts Council, England to exhibit in the Project Space at Collect – the international art fair for the contemporary object. For this project I worked with historical military patterns of British Army uniforms sourced from tailoring books dating back to 1800. They were used to derive an academic dress narrative of body coat uniforms of the British Raj archived at the National Army Museum. An affirmative association from my adolescence was the authoritative figure of Ashton Pelham-Martyn, an English officer from the British Raj falling in love with Anjuli-Bai, an Indian princess in the forbidden love tale The Far Pavilions. I’m looking at theories of Cubism and Abstraction particularly in respect to art history linking them into a contemporary context. Also the whole ‘Love Gardens’ project was triggered by the colonial history of the British Raj. Patterns are an incredible material to discuss history. You can tell so much about us humans by analysing them – like cultural connotations, choice of dress, shapes of bodies, influences from the east etc. So definitely my work reminisces the past. 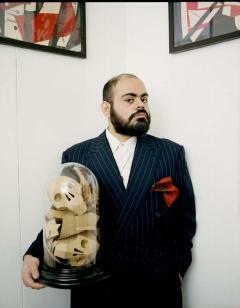 My first dwelling into the Art world was when I launched Dead Man’s Patterns (2008) inspired by the first set of bespoke suit patterns of a deceased customer that I acquired. Each section of the book suggests different physical states of the ‘man’ with a sense of formal preparation for burial. The physical man is never there; the book’s pages gesture towards intimacy even though they are merely paper. 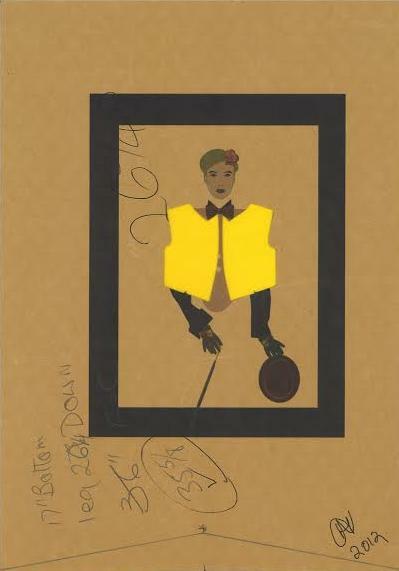 Dead Man’s Patterns was acquired by 25 collections around the UK and America, including the British Library, National Art Library, Courtauld Institute, Iniva collection and the Fashion Institute of Technology, New York. 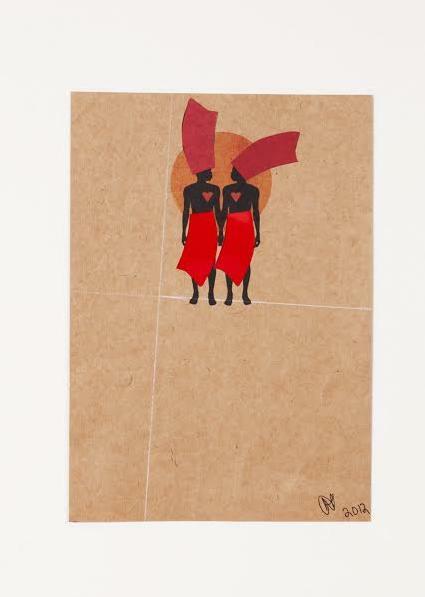 It was then that Sir Paul Smith became aware of Narielwalla’s work and exhibited his first solo show Study On Anansi in 2009, where he focused on patterns combined with Western African Folklore tales. I guess the ‘fashion’ side of me informs the colour aspect of the artworks. I used to work as a stylist in India and I do think one of the fascinating genres of fashion is the use of colour, and because it’s ever changing, so quickly and on such a large scale – I think designers have to reinvent themselves constantly. I look at Parisian couture carefully looking at what colours go. My background of vibrant India, whose people aren’t afraid of colour, I guess also has something to do with it. An exciting and ground breaking artist using unique methods, Hormazd Narielwalla’s work is a celebration of both ancient tailoring techniques, collage and the human form, often creating two dimensional works that suggest the three dimensional through the original tailor’s marks on the materials he uses – suggesting that there was once a human form that occupied the space.